After repeatedly losing his cap on the wind-whipped locomotive where he works, George Kromer asks his wife, Ida, to stitch a new-fashioned baseball cap with a higher crown, a pull-down earband to keep it snug, and a soft, cloth visor. Quickly, Stormy’s fellow engineers beg him for their own six-panel caps. Ida’s sewing machine begins to sing. When the demand for caps overwhelm the Kromer’s small, Kaukauna, WI operation, Ida and her helpers move production to a bona fide factory on North Broadway in Milwaukee where the company continues to grow, eventually employing an average of 25 to 30 workers. Six decades after starting Stormy Kromer, our founder’s health begins to fail, and he passes the hat, if you will, to Richard Grossman, who continues production into the 21st century. 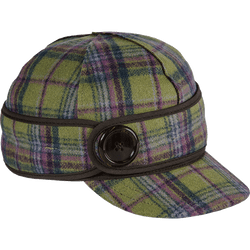 When word spreads that production of the legendary Kromer cap will soon cease, Bob Jacquart makes a call to Milwaukee and, one month later, relaunches Stormy Kromer from its new home at Jacquart Fabric Products in Ironwood, Michigan—still made in the USA, still crafted by hand. According to Bob, the best purchase he’s ever made. 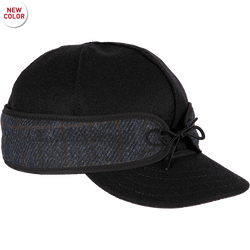 Stormy Kromer builds on its iconic cap with the “Ida Kromer,” a shorter-brimmed version of the original that acknowledges a hundred years of mostly-male aesthetic and says: “Wait, why not take care of the ladies, too?” A striking new palette of colors, the forerunner of best-sellers such as the "Petal Pusher," and a perfectly-fitted homage to the woman whose needle and thread sparked the entire enterprise. 114 years after Ida’s first stitch, the Jacquart family celebrates its part in the renewal of the Kromer brand, the vitality of Stormy’s ongoing legacy, and a commitment to usher the company into a bright, always authentic future. Your Stormy Kromer comes with more than a perfect fit and stellar construction. Register your cap below and receive a little protection for your peace of mind.